In 1992, Yazoo Records released a video (now available on CD and DVD) titled "Times Ain't Like They Used To Be." Through previously unpublished film footage, this project provides viewers a glimpse of pioneer country musicians performing their music in styles that were in vogue between 1928 and 1935. The visual images of this video contain clues to venue, costume, and performance mannerisms that enhance the sound and present a fuller representation of the era's music than can be captured on records alone. At a distance of almost a century, it can be both humbling and inspiring to contemporary country and bluegrass musicians and their audiences to pause and contemplate the lives and times of their early counterparts who, out of the folk music traditions of this country, forged genres that are performed and enjoyed today. Before his death in 1986, one of Kentucky's numerous talented and versatile country musicians, Curley Collins, talked at length to media representatives about his career that began when he was 14 years old. Although Collins never had a hit record, he represents that legion of unsung country music heroes who, during the 1920's through the early 1950's' depended for a living on personal appearances and the radio stations from which they were allowed to advertise their show dates. Like the Yazoo video, Curley's story takes one back to an era in the evolution of country music that existed before television, rock'n'roll, and the Nashville sound wrought forever their changes on the character of the genre. 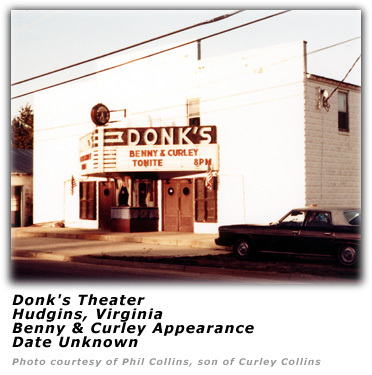 The country music era that Collins knew was one in which performers traveled the unpaved back roads and pre interstate highways of this country in often unreliable automobiles to fill show dates in small town theaters, rural school auditoriums, and clapboard country churches. There, without benefit of sound systems and in	the glow of kerosene lamps, they entertained small, but appreciative audiences, many of whom had spent their last hard earned dime for the privilege of listening. Collins, like many of his contemporaries, knew the joy and economic relief of invitations to free meals and lodging received from adoring fans, and when these were not forthcoming, he knew how to sleep and prepare meals on the sides of roads that were populated by too few and too expensive accommodations of rest and nourishment. Travel to Collins and his fellow country music performers meant up to six people and as many instruments crowded into one sedan with an acoustic bass lashed to the top. The concept of a tour bus never entered their minds. Collins knew the emotional toll of pulling up stakes every few months to move on to a new radio station and a new territory where he would be welcomed as a new voice and a new personality by listeners who would attend his personal appearances at least once. And when all the receptive venues within a reasonable distance of the radio station had been booked, and audiences were anxious to savor new talent, he knew it would be time to make another move. Curley Collins knew how to adapt to new working conditions how to adjust to new band leaders, how to form new musical partnerships, and how to use his talents to create a balanced show and cater to the different tastes of different audiences. In short, Curley Collins was a professional pioneer country music artist whose career illustrates in microcosm the generation of performers who paved the way for today's stars of bluegrass and country music. Ruey "Curley" Culbertson Collins was born July 28, 1915, near Catlettsburg, Ky., a tiny town in the eastern coal field region of the state at the confluence of the Big Sandy and Ohio Rivers where the states of Kentucky, Ohio, and West Virginia come together. 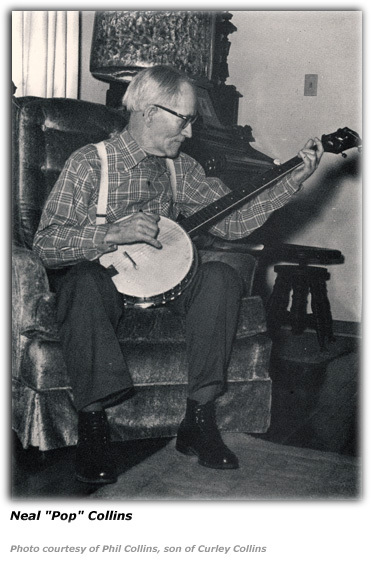 Curley's great grandfather, Conaway Collins was proud of his fiddle and banjo and possessed a considerable ability to play them. A love and talent for music was handed down to succeeding generations who sang and played a variety of instruments as a matter of course. "We all just learned," is the way Curley's father, Neal, explained it. "No one ever taught us." Neal, whose expertise on the banjo has been recognized by the Smithsonian Institution, compounded his descendants' musical proclivities by marrying Maggie McKnight, a woman equally gifted as a musician. A favorite family story tells of her playing pump organ in church when she was so small her feet couldn't reach the pedals. She sat in the lap of her grandmother who pedaled while Maggie played. 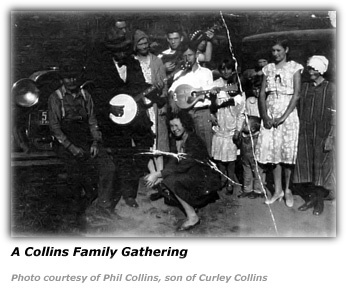 Other musical connections in the Collins family include the Amburgeys of Letcher County, Ky. Through his great-grandmother, Polly Amburgey, Curley is a fourth cousin once removed to the famous Amburgey Sisters (BU, February 1995), a pioneer all female string band whose members became famous individually as gospel singer Martha Carson; banjoist and songwriter Mattie O'Neill (also known as Jean Chapel); and singer/ fiddler Minnie Amburgey. 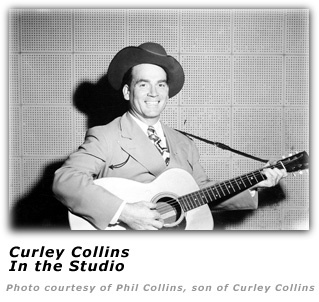 Curley Collins grew up listening, not only to family members making music, but to country music on radio and records. In addition to programs on nearby radio stations, the Collins family tuned in to such distant broadcasts as the WLS National Barn Dance from Chicago and the Grand Ole Opry from WSM in Nashville. The family's record collection included songs and tunes by such performers as the Carter family, Jimmie Rodgers, Gene Autry, and Gid Tanner and the Skillet Lickers. Neal Collins was in great demand in his community to provide music for dances and other social gatherings. When his children came along they learned to play instruments, and before long he found himself the head of a family band. 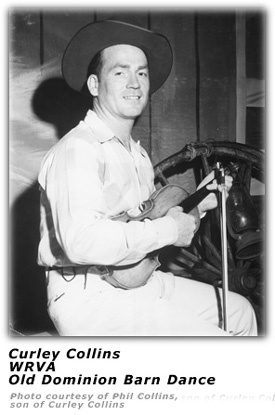 Curley often related how he learned to play banjo so he could take his place with the group. "When I was ten years old, my father set me down in a kitchen chair with a five string banjo and told me that when he came home, I'd better be playing a tune. He gave my mom orders not to let me up except to eat and go to the bathroom. When he came home I was playing a tune." Curley soon learned to play the guitar, an accomplishment that contributed to his becoming the only one of Neal Collins' children to pursue a career as a professional musician. 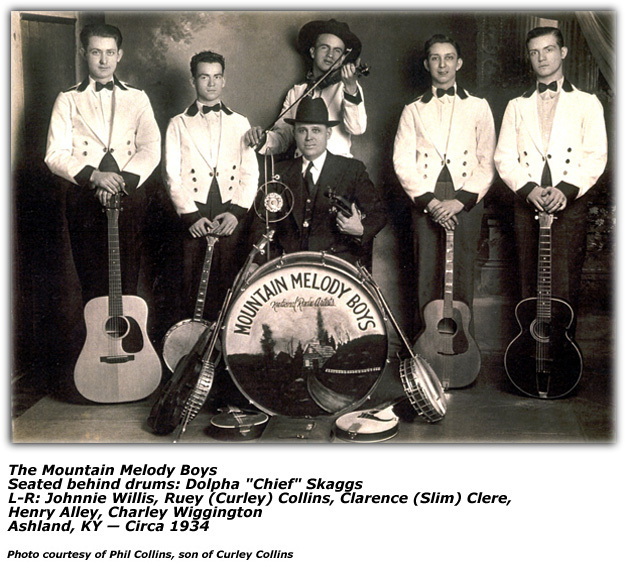 "A friend of the family, Dolpha Skaggs, who was police chief of Catlettsburg had a group named the Mountain Melody Boys," Curley recalled in later years. "They were on WSAZ in Huntington, West Virginia One of the group, Chuck Wiggins, was ill and Chief Skaggs asked my father if I could stand in for him on guitar. 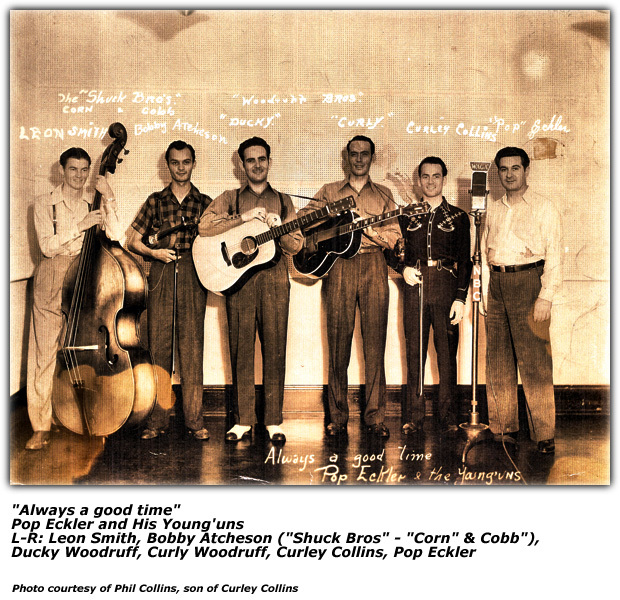 When Chuck did come back to the group, Chief Skaggs kept me on to play tenor guitar and banjo." 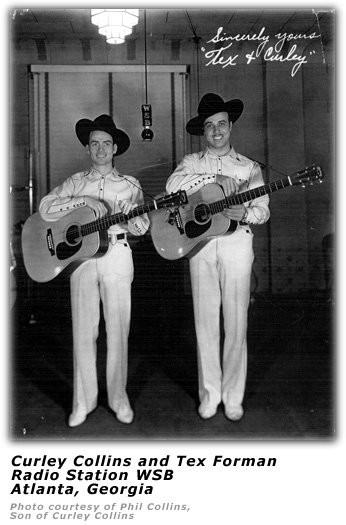 Chuck Wiggins later played guitar with Pee Wee King's Golden West Cowboys. In his autobiography, Hell Bent For Music, King states that Wiggins was his "right-hand man for a long time" and tells how this guitarist and comedian was traveling with the Golden West Cowboys the night King and Redd Stewart wrote "The Tennessee Waltz." 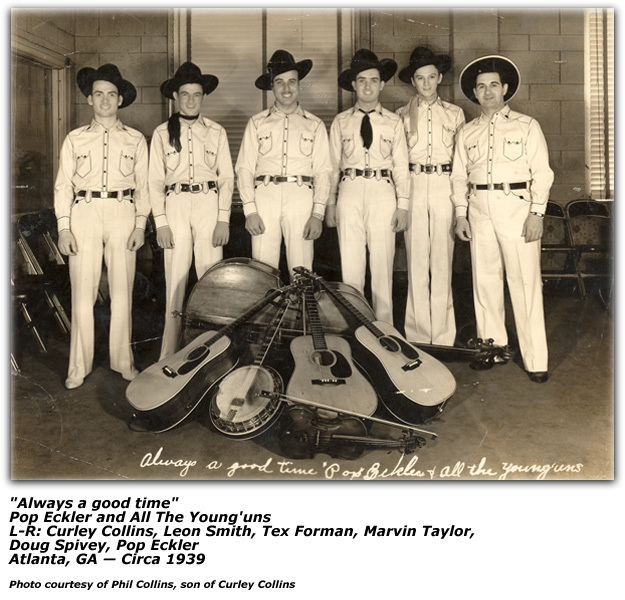 Curley Collins, who was in his early teens at the time, could not have handpicked a better act than the Mountain Melody Boys with which to train as a professional country musician. The group was organized primarily as a church and Sunday School group in late 1927 or early 1928 by non performer Dolpha Skaggs. They quickly attracted a large following and soon found work making personal appearances at regional theaters and other venues. They made their radio debut on WSAZ in February of 1928, and in April of 1935 they became the first band to broadcast on the newly launched WCMI in Ashland, Ky. In 1938, the group went to New York where they played a six week engagement at the Village Barn, appeared on the weekly CBS radio network's Major Bowes' Original Amateur Hour, a show that auditioned up to 700 fame and fortune seeking acts per week, and signed a contract with another network amateur program, NBC's Town Hall Tonight, the show that discovered Frank Sinatra. But Curley was not with the Mountain Melody Boys during these heady days in New York. He had gone on to what presumably he considered to be greener pastures. While still working as a member of the Mountain Melody Boys he had teamed up with his younger brother Ransome, guitarist and mandolin player, and a friend, fiddler Clarence "Slim" Clere, to form the Prairie Pals. Between 1933 and 1935, this group performed in the same general area as the Mountain Melody Boys, and Curley worked in both acts. When Ransome dropped out to spend more time on his schoolwork, the Prairie Pals became a quartet with the addition of guitarist, comedian, and bass fiddle player, Tex Forman, and fiddler Reedy Reid. The Prairie Pals were heard regularly on radio station WCMI in Ashland, Ky., and filled show dates in the area. 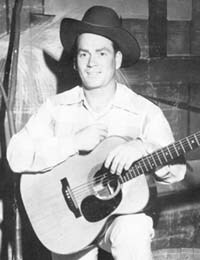 After leaving the Prairie Pals, Slim Clere continued his musical career in Charleston, West Virgnia, and was associated for several years with T. Texas Tyler who became widely known for his post World War II hit "Deck Of Cards." The mid 1930's was a busy time for Curley Collins. In addition to working in two bands and angling for a better job in the entertainment business, he found time to get married and start a family. When Curley's matrimonial aspirations did not fare well with the mother of the prospective bride, the young couple resorted to the age old ploy of elopement. Curley, who was 20, and Hazel Maddix, his bride to be, who was 17, sought the knot tying services of the legal establishment of an adjoining county noted for not demanding too much in the way of age verification of those in search of matrimonial bliss. Miss Maddix, reluctant to lie about her age, wrote " 21 " on a piece of paper and put it in her shoe so she could truthfully tell the judge that she was "over 21." Records show that Curley, apparently innocent of the qualms experienced by his sweetheart, gave his age as 22. Curley's new mother-in-law was irate after learning of the nuptials for the first time when they were announced on the radio where Curley was performing. Slim Clere, who was around at the time, explained in later years the likely source of the future mother-in-law's attitude toward the minstrel suitor. He spoke of a kind of stereotyping that early hillbilly musicians had to contend with. "People thought a fiddle player was just about as ornery as you could get," he said. "People would not hire a hillbilly musician for anything, as they thought they wouldn't work at anything besides music." While Curley was getting adjusted to married life and cultivating the approval of his wife's family, he had an opportunity once again to join a new act. 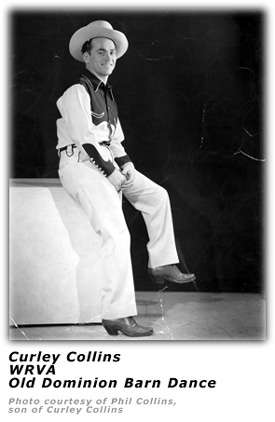 In the spring of 1936, a native of Dry Ridge, Ky., Garner "Pop" Eckler, brought his locally famous Barn Dance Gang to Ashland where they put on a show at the Grand Theater. Eckler and his group were appearing regularly on two radio stations, WLW and WKRC in Cincinnati. Eckler earlier had appeared on WCKY in Covington, Ky. 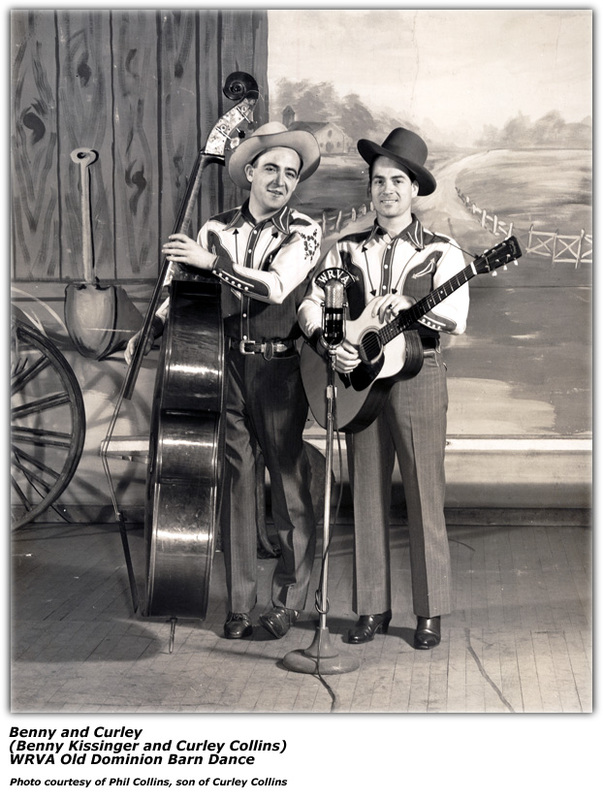 Sharing the bill with Eckler on the Grand Theater show in Ashland were the Prairie Pals who performed as a group, as well as featuring Tex Forman as a comedian and Reedy Reid as a breakdown fiddler. In short order, Eckler had incorporated the Prairie Pals into his band that was soon renamed Pop Eckler and His Young'uns. Curley quickly learned something about fan loyalty and the popularity of Pop Eckler's radio show. "We had a show at seven o'clock in the morning on WCKY in Covington, thirty five miles away," he recalled. That was early for entertainers who frequently had been out filling a show date until the wee hours of the morning. To be on time at the station Pop and his band often tested the vigilance of the police department in enforcing the speed limit. "They had a speed trap all the way to Covington," Curley continued. "Twenty five miles an hour, and if you got to making twenty six, they'd give you a ticket. They hauled us in one morning. I forget what our fine was, but Pop paid it, and when we got on the air that morning, he started telling listeners about the speed trap." The law enforcement officers who were listening made overtures of peace to Pop, and things were soon patched up between them. "From then on," Curley said, "there was a cop waiting on us, and he'd blow his siren and take us into Covington as fast as we wanted to go. We didn't have any more worries about being late." In July of 1936, an official at the 50,000 watt radio station, WSB, in Atlanta, Ga., invited Pop Eckler's group to become members of the station's popular Cross Roads Follies program. WSB had a long history of country music programming dating back to 1922, the year the station went on the air. 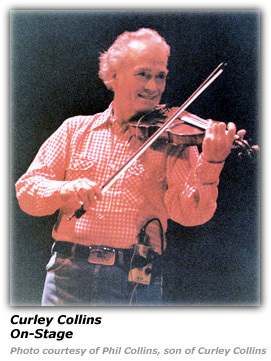 Such artists as Fiddlin' John Carson (Bluegrass Unlimited, July 1985), Gid Tanner's Skillet Lickers, Riley Puckett (BU, Oct. 1984), and Clayton McMichen (Bluegrass Unlimited, May 1979) had gained national popularity, in part, through their broadcasts over WSB. The Cross Roads Follies had been on the air for five months when Eckler and his group joined the program. It was a mid day variety show featuring several country music acts. During their stay at WSB, Eckler and His Young'uns would share time on the program with such well known performers as Pete Cassell (BU, May 1993), Hank Penny, Cousin Emmy (Bluegrass Unlimited, Oct. 1985), and "Rocky Top" composer, Boudleaux Bryant (BU, April 1982). As was the general custom in those days, WSB did not pay a salary an arrangement that required the artists to hustle for personal appearance dates in order to make a living. Curley Collins remembered well those early days in Atlanta. "When [we] came to Atlanta, show dates were scarce," he later recalled. "Being down on our luck, Pop, known for his persuasive ways of talking, got all of us free rooms at [a] rooming house [on] West Peachtree Street. The first eleven days that we were in Atlanta we had soup beans three times a day. On the twelfth day we had a show date at Carrollton, Georgia, and we each made four dollars. On the way back to Atlanta we bought steaks and had a feast." Pop Eckler's stage shows became legendary events within WSB's immediate listening area, the territory sufficiently close to Atlanta to allow the group to make an evening show date and get back to the station in time for the radio program. 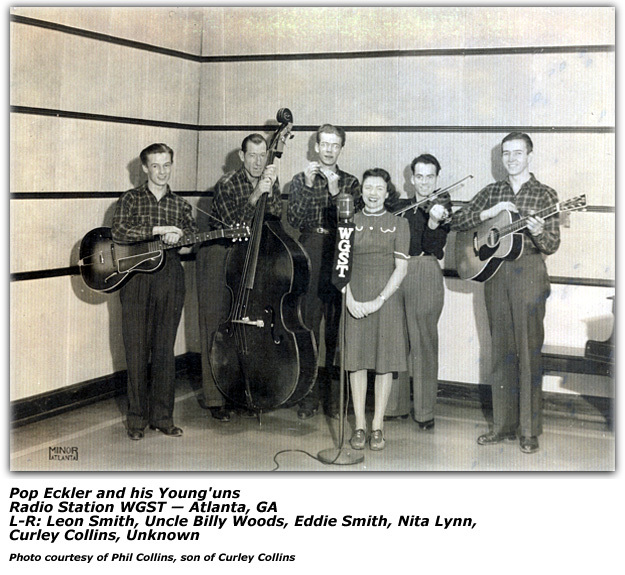 The diverse talents of the Young'uns enabled Eckler to present a show that featured comedy, banjo, fiddle, and harmonica instrumentals, and a variety of vocal numbers ranging from old time ballads to gospel songs. By grouping various members of the six person act into duets, trios, and quartets. Eckler's shows achieved the variety that usually required a much larger cast. "By September of 1936," according to Curley Collins, "Pop and His Young'uns popularity had grown to the point where we were performing seven days a week. In some instances, we were playing three shows a day. [We] played in just about every nook and cranny of the state, including a place in the heart of the Okefenokee Swamp. [We] also played show dates in Florida, Alabama, North and South Carolina, and Tennessee." When Pop Eckler noticed blanks on his show date schedule, he found ways to fill them. 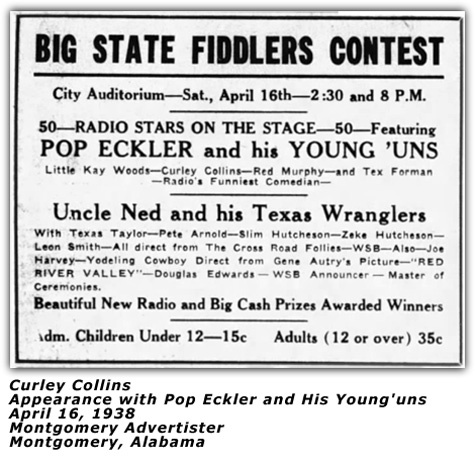 Curley Collins remembered, for example, that "in 1937, Pop started sponsoring fiddlers' contests all over Georgia. 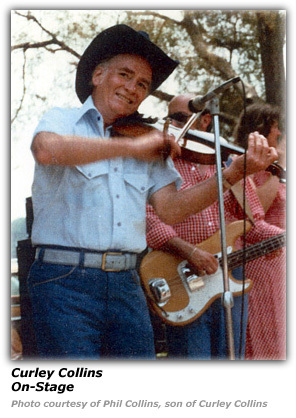 Pop knew that I could play one tune on the fiddle, "Cacklin' Hen," and insisted that I enter the fiddlers' contest [that he sponsored] in Rome, Ga. Because of the reaction of the crowd after I finished, the only encore I could give them was to play "Cacklin' Hen" once more. The prize was a big old Crosley radio, and when I finished, I went over and sat on the radio. The crowd went wild, and everyone knew I was the winner before it ended. "When we returned to Atlanta, unknown to me, Pop bought me a fiddle for a hundred dollars. I practiced six to eight hours a day under Pop's supervision. In early 1938, in Macon, Ga., I won a fiddlers' contest playing `Lost Train Blues.' which I played with no accompaniment and talked. I won this contest over a very popular musician called Big Howdy. "On June 18, 1938, Pop sponsored a fiddlers' contest [billed as the National Fiddlers' Contest] at the City Auditorium in Atlanta. There were 84 contestants and I am very proud to this day that I was the winner. The National Fiddlers' Championship was mine." In December of 1936, WSB underwent a change in ownership and by 1940, new management had revamped the station's country music programming. As a result, Pop Eckler and his group moved to other radio stations in Atlanta and other cities. 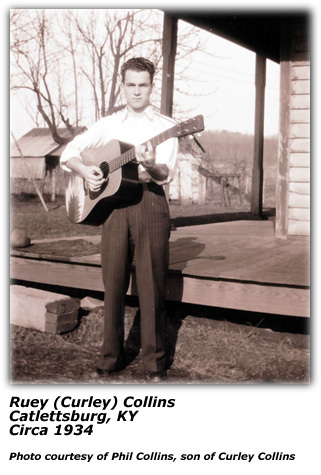 Shortly before his death, Curley Collins told Charles Ganzert, producer of a documentary radio program on the history of country music, about his experiences after he and Pop Eckler left Atlanta to work their way to Wheeling, West Virginia, as performers with the Scotts Exhibition Shows. "We traveled in automobiles," Curley related, "and sometimes, it was three or four weeks at a time we never seen a bed. In the summertime, we'd take the seats out of the car along side the road or anywhere, and some [would] lay on the seats and some [would] lay inside the car. Whenever we had to shave, we'd drain the water out of the radiator and take one of the hubcaps off and put the water in the hubcap, so we'd have hot water to shave with. We had another little gimmick, too. At that time, we was traveling in a 1927 model Packard, and we had a'29 model Chrysler [that] had a great big cover over the manifold all the way up and down the engine, and we'd keep that shined real good and warm up our baloney and bread [on it]." Curley left Pop Eckler's group for a time when they were in Atlanta and worked with Hank and Slim, who headed up the Georgia Crackers group. Wheeling, West Virginia, was a logical destination for Curley. Since 1933, the city's radio station, WWVA, had been broadcasting the Wheeling Jamboree, a Saturday night stage show cast in the mold of the Grand Ole Opry. By the time Curley reached Wheeling, WWVA (at 50,000 watts) was the most powerful station in the state, and the Jamboree was one of the most popular and best known shows of its kind in the country. Wartime demands, however, interfered with Curley's and Pop's aspirations to establish themselves on the show. "We joined the cast of WWVA for a short time," Curley said, "[but] Pop, being an ex-railroad man, was called back to work because of the oncoming war. That is when we went our separate ways." Curley moved on to Charleston, West Virginia, where he worked briefly on WCHS with former Mountain Melody Boy and Prairie Pal, Slim Clere. But Curley's patriotism won out over his desire to further his entertainment career, and he was soon on the move again. "I went to Pittsburgh, Pa., [and went to work] on a defense job, received a promotion, and was sent to Chicago," he said. "Feeling a desire to serve my country actively, I wrote the draft board in Atlanta, and they welcomed me with open arms. I was inducted into the Army at Fort McPherson in Atlanta [on October 23, 1943]. The first night on base, I won a contest and was offered the opportunity of working with Special Services and remaining at Fort McPherson. However, I still wanted to serve as an active soldier. I enjoyed playing for fellow servicemen in chow lines in the European theater of World War II." 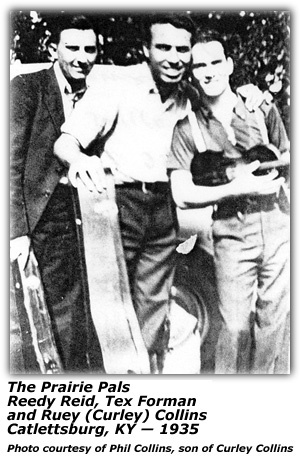 After his discharge from the Army on October 4, 1945, Curley lost no time getting back into the music business, and in short order, he was reunited with two former fellow performers, Marvin Taylor and Benny Kissinger, with whom he had worked while at WSB in Atlanta. "After my discharge from the Army in 1945," Curley said, "I heard a friend of mine, Marvin Taylor, on a radio station in Richmond, Va. 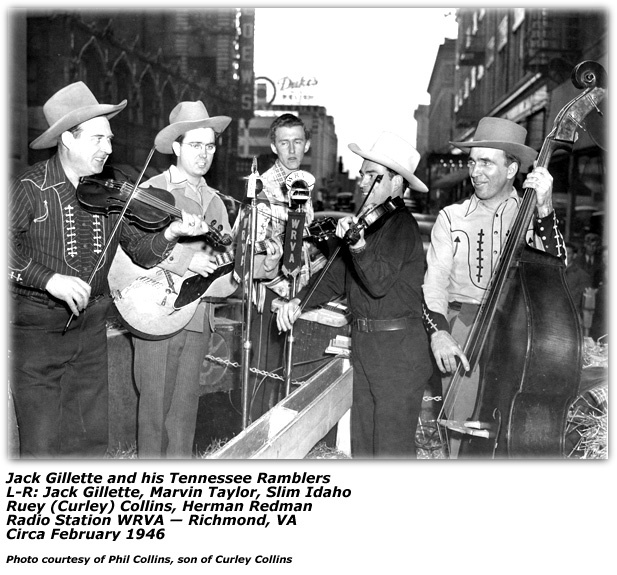 He was with a group called Jack Gillette and the Tennessee Ramblers. I contacted Marvin and joined their group right away. The group consisted of Jack Gillette, Don White, Marvin Taylor, Slim Idaho, and myself. We played show dates while performing on WRVA. When we needed another man to play bass and sing, I contacted my old buddy Benny Kissinger, and he and his brother joined our group. We then went to WWVA for a short while." While at WWVA, Curley worked on the Jamboree with such artists as Hawkshaw Hawkins, Pete Cassell, and Millie Wayne. 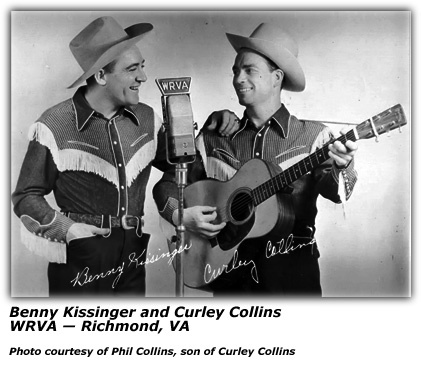 After the Tennessee Ramblers disbanded because of "conflicting commitments," Curley and Benny Kissinger returned to WRVA where they became long time performers on the station's Old Dominion Barn Dance. The Old Dominion Barn Dance made its debut on Richmond's 50,000 watt WRVA in September of 1946. Though a relative lalate comero the radio barn dance scene, it soon became one of the most popular shows of its kind among country music fans and one of the most sought after venues by country music artists. The Old Dominion Barn Dance was one of several barn dance shows which, in the mid 191950'swas broadcast regularly on the CBS radio network's Saturday Night Country Style program. Such country and bluegrass music acts as Mother Maybelle and the Carter Sisters, Mac Wiseman, Grandpa and Ramona Jones, Don Reno and Red Smiley, Wilma Lee and Stoney Cooper (BU, Feb. 1982), and Flatt and Scruggs, were all regular performers on the show. The manager and emcee of the Old Dominion Barn Dance, which originated from the stage of the Lyric Theater, was Sunshine Sue Workman (Bluegrass Uunlimited, June 1991), a singer and mufti instrumentalist whose work on radio stations from California to Virginia included a stint on the WLS National Barn Dance in Chicago. Marion Lee Hall reported in 1947 that the Old Dominion Barn Dance was a daily show over WRVA. It was an hour long show starting at 3:00pm and running to 4:00pm. But we also learn in Bill Boyd Ranch House News Newsletter in June of 1947 that the show also aired on Monday, Thursday and Fridays from 9:30am to 10:30am, then 3:00pm to 4:00pm on Saturdays as well as 8:00-8:30pm and 10:45 to 11:30pm. 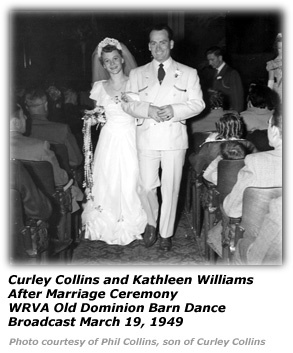 Curley and Benny were perennial favorites on the Old Dominion Barn Dance until its demise in the mid 191950'sWhen Curley decided to get married for the fourth time, he and his bride, Kathleen Williams, made it possible for Curley's fans to attend the wedding. 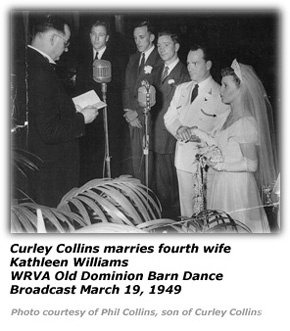 Before an overflow crowd, the ceremony took place on Saturday night March 19, 1949, on stage during a performance of the Old Dominion Barn Dance, and the "I dos" were broadcast over WRVA. It would be more than three years before Hank Williams would make headlines with his October 1952 marriage to Billie Jones during performances of the Louisiana Hayride show on the stage of the Municipal Auditorium in New Orleans. 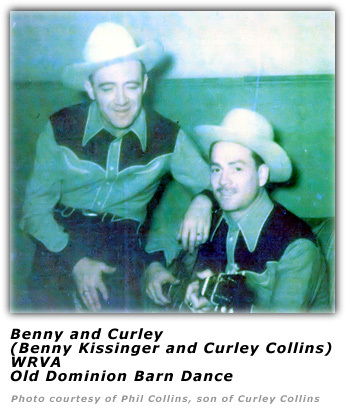 After the Old Dominion Barn Dance folded, Curley took a nonon-musicelated job from which he retired in 1979. He did not give up his music, however. 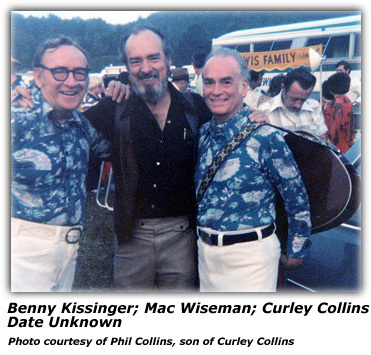 In their spare time, he and Benny Kissinger continued to work as a team and performed regularly on local television stations and stage shows. 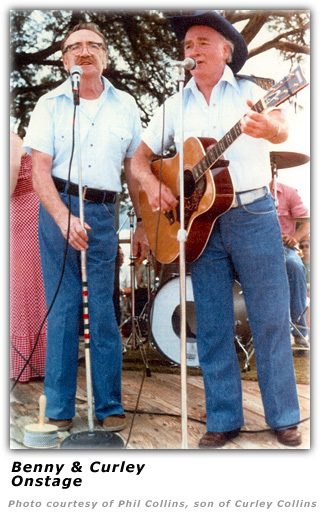 For several years, they were regular performers on Virginia's Lil' Ole Opry, a Saturday night country music show along the lines of the Old Dominion Barn Dance, that was staged in Mathews, Va., on the Chesapeake Bay. In 1981, Curley and Benny journeyed to Nashville where they recorded an album titled "Benny And Curley Sing, Nashville Picks," punctuating the title to show that their singing was backed by some of Nashville's top session musicians. Heard on the album are Hoot Hester (fiddle), Jimmy Kapps (guitar), Lloyd Green (steel guitar), Lightning Chance (upright bass), Buddy Harmon (drums), "Pig" Robbins (piano), and Ray Edenton (rhythm guitar). Some 35 years earlier, Curley and Benny had cut two records for Nashville's Bullet label. "One was `In The Same Old Way,' sung by Benny Kissinger and written by me," Curley recalled. "Flip side was `Nothing To Lose,' sung by Benny [and his brother] Bud Kissinger. The other was `It's No Use,' sung by Benny, and the flip side was `My Blue Eyed Baby,' sung and composed by myself." Curley Collins, at the age of 71, died almost literally with his boots on in a Richmond, Virginia, hospital on October 27, 1986. He and the band Shades Of Country, for which he played fiddle, were preparing for a show when he became ill and was rushed to the hospital. 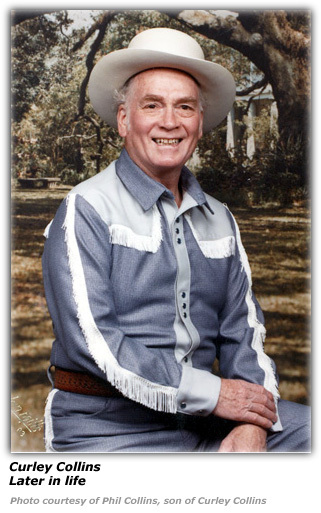 The band learned of his death just minutes before going onon stageCurley had been inducted into the Atlanta Country Music Hall Of Fame in 1984 and was inducted posthumously into the Old Dominion Barn Dance Hall Of Fame in 1991. 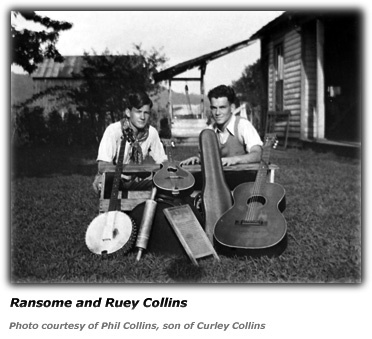 Hillbilly-Music.com wishes to express its appreciation to Phil Collins, the son of Curley Collins for providing us with the article about his father and the photos. Hillbilly-Music.com wishes to express its appreciation to Wayne W. Daniel, country, gospel and bluegrass music historian and author of "Pickin' On Peachtree: A History Of Country Music in Atlanta, Georgia" for granting us permission to use his article.